Whether in the planning, design or construction phase,RLB+A has a robust list of projects underway across the U.S. at any given time. 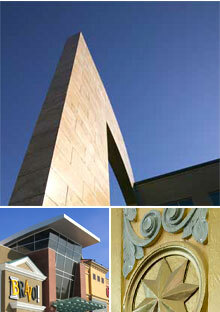 RLB+A has an impressive portfolio of K-12 and higher education projects completed, in design or under construction. Our Construction Management group alone has been awarded K-12 contracts with a cumulative construction value exceeding more than $500 Million in the past 10 years. RLB+A has extensive experience in all types of retail building design, including mall development and re-development, new and renovated strip centers, the latest in lifestyle design and national prototype programs. For one national retailer alone, we have designed 800+ stores in 49 states. From low-rise to high-rise, RLB+A's office building designs run the gamut from local regional offices to worldwide headquarters. Recent Class A office projects have included projects for the General Service Administration and the corporate headquarters of a national retail development company. Municipal centers, courts, police stations, fire stations, service centers and correctional facilities are among the government projects that RLB+A has completed at the local, state and federal levels. RLB+A has designed a variety of facilities for regional transit authorities and railroads as well as The Ohio Turnpike Commission and Cleveland Hopkins International Airport. Whether entertainment venues or community recreation centers, RLB+A has the experience to design facilities that are specially equipped for leisure activities. Aside from the categories listed above, RLB+A has provided A/E/C services for housing, hospitality and infrastructure improvement projects.